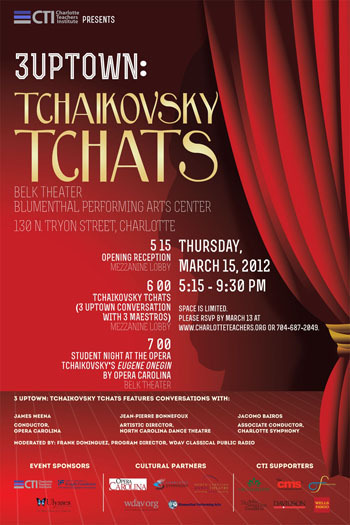 Teachers and the public engaged with artistic leaders from three of Charlotte’s premier performing arts organizations at “3 UpTown: Tchaikovsky Tchats” on Thursday, March 15, 2012, at the Blumenthal Performing Arts Center, at a free event presented by Charlotte Teachers Institute. The evening began with a reception at 5:15 p.m., followed by an informal panel discussion at 6 p.m., and culminated with Opera Carolina’s “Student Night at the Opera” performance of Tchaikovsky’s Eugene Onegin at 7 p.m. 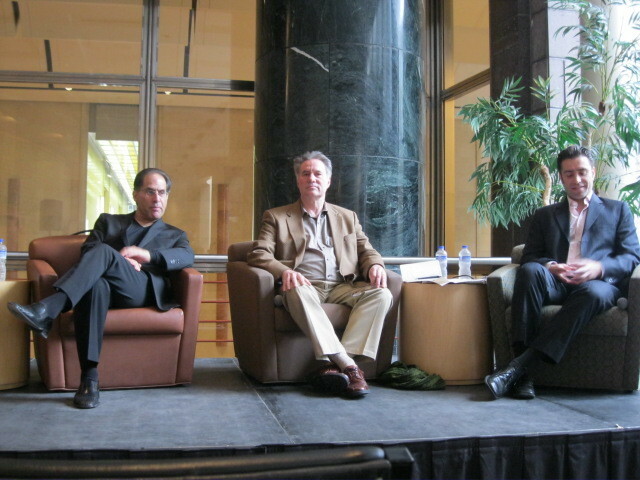 The “3 UpTown: Tchaikovsky Tchats” panelists were James Meena, general director and principal conductor of Opera Carolina; Jacomo Bairos, associate conductor of the Charlotte Symphony Orchestra; and Jean-Pierre Bonnefoux, president and artistic director of the North Carolina Dance Theatre. The three organizations are collaborating to produce Charlotte’s Ulysses Spring Arts Festival, with this year’s focus on the Russian composer Peter Illych Tchaikovsky. Each presented a variety of performances related to the iconic composer who worked in musical forms from symphony to opera to ballet. The panelists reflected on their own relationships with Tchaikovsky’s work and provided a behind the scenes look at Opera Carolina’s performance of Eugene Onegin. 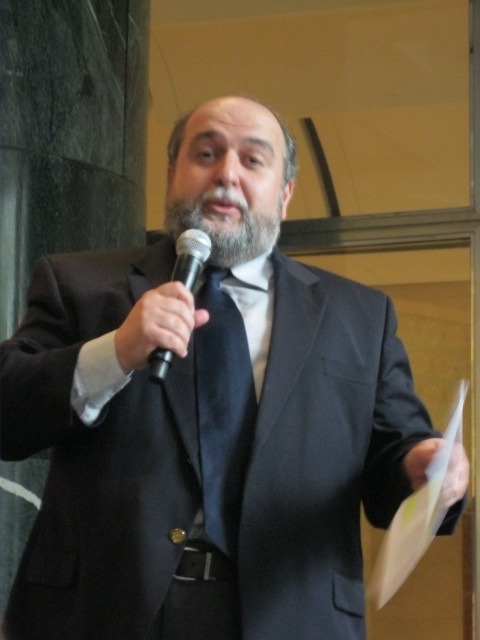 WDAV Classical Public Radio’s Frank Dominguez moderated the conversation in a talk-show style format with audience participation. Eugene Onegin, the passionate story of a young man who comes to regret giving the cold shoulder to a woman who loves him, is based on the classic novel by Alexander Pushkin and was Tchaikovsky’s first great popular success in opera. Opera Carolina’s production included international guest artists as well as dancers from the North Carolina Dance Theatre and orchestral accompaniment from the Charlotte Symphony. Thanks to English translations projected on a screen, the audience enjoyed the beauty of Pushkin’s original Russian verse while following the twists and turns of the plot. This Student Night at the Opera performance also included a live question and answer session with the cast at intermission. Admission to the evening’s events was free to those who registered in advance. 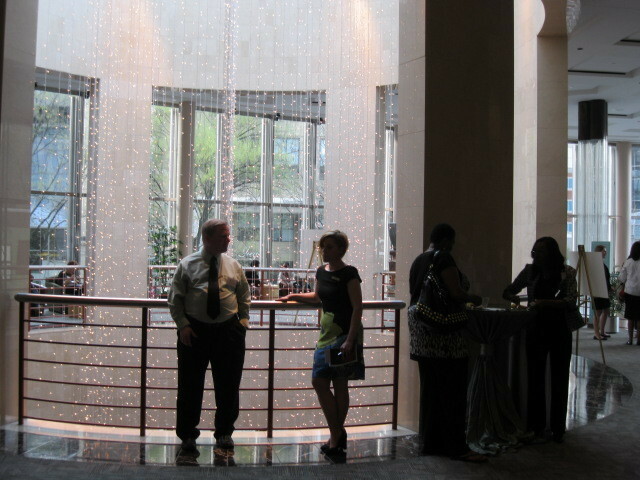 CTI’s UpTown events engage and educate Charlotte-Mecklenburg Schools teachers and the community at large, as CTI and its cultural partners produce forums for examining topics through multi-disciplinary lenses. Part of the Ulysses Spring Arts Festival, “3 UpTown: Tchaikovsky Tchats” was sponsored by CTI, the John S. and James L. Knight Foundation, and the Ulysses Festival, as well as CTI’s 3 UpTown community partners: Opera Carolina, the Charlotte Symphony, the North Carolina Dance Theatre, WDAV Classical Public Radio and the Blumenthal Performing Arts Center. 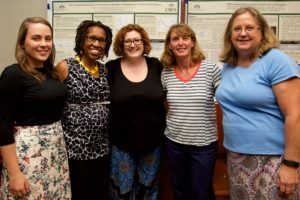 Charlotte Teachers Institute, a collaboration among Charlotte-Mecklenburg Schools, Davidson College and the University of North Carolina at Charlotte, cultivates content knowledge, creativity, leadership skills and collaboration within and among Charlotte’s public school teachers. CTI is made possible by a joint commitment of resources and energy from all three Institute partners and by generous support from the Arthur Vining Davis Foundations, the Belk Foundation, the John S. and James L. Knight Foundation and The Wells Fargo Foundation. 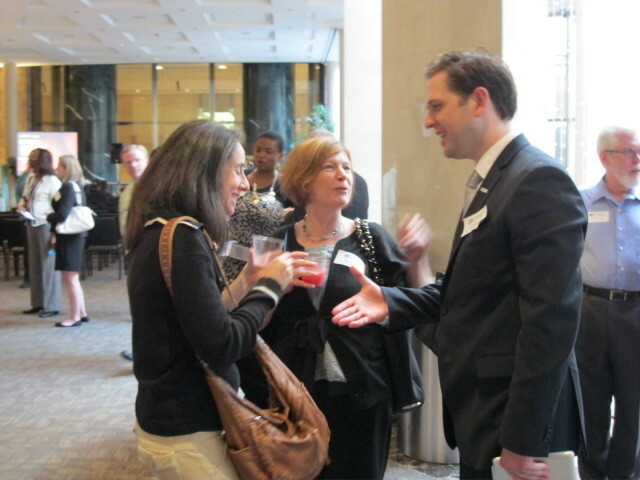 CTI is an affiliate of the Yale National Initiative to Strengthen Teaching in Public Schools. Posted on March 7, 2011 by clas-web. This entry was posted in Other Special Events. Bookmark the permalink.